Mac Baren Virginia No. 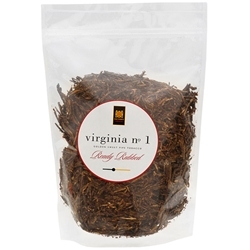 1 Pipe Tobacco, is a ready rubbed mild blend made from high-quality Virginia tobaccos. Introduced in 1957, Mac Baren Virginia No.1 continues to be the standard choice among Danish aromatic pipe blends for decades. Remarkably smooth and mellow tasting that packs easily into any shape smoking pipe, perfect for an all-day smooth and aromatic smoke.